Years ago, as my love for sewing grew to a fire looking to reignite, I walked into a modern sewing guild meeting wondering if modern quilts might be what was calling to me. (Spoiler: They weren’t.) Yet, it was through those meetings that I met Melanie Tuazon. She was the enthusiastic, supportive, note-taking, sit-right-up-front woman and it was obvious everyone in the room was as drawn to her as I was. I’ve been lucky enough to build a friendship with her that spans nearly a decade now and during that time her quilts have blown the modern quilting world away. 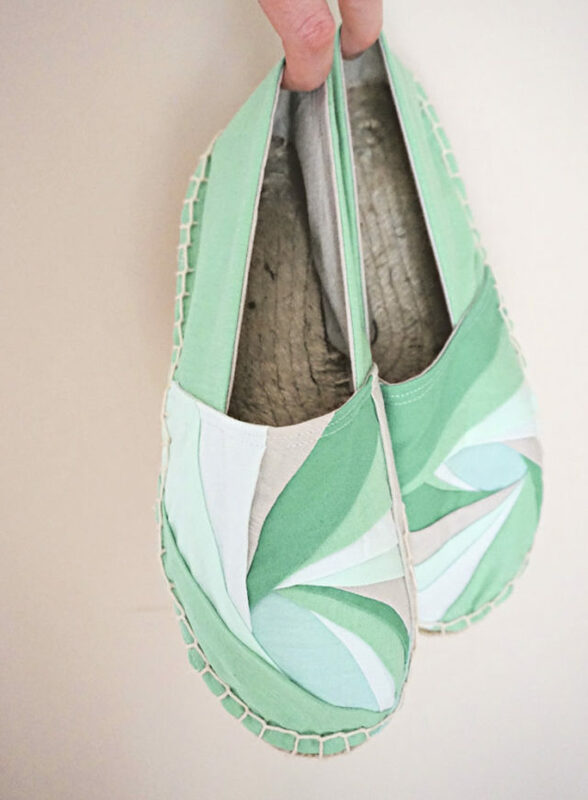 I’m absolutely humbled and honored to show you Melanie Tuazon’s Quilted Espadrilles for the April edition of the The Artist Series. As you can see Melanie combines unexpected colors that sing to each other into designs alive and expressive. Part of what makes Melanie and her quilts so special is how she uses her art to explore her own experiences and emotion in and about the world. 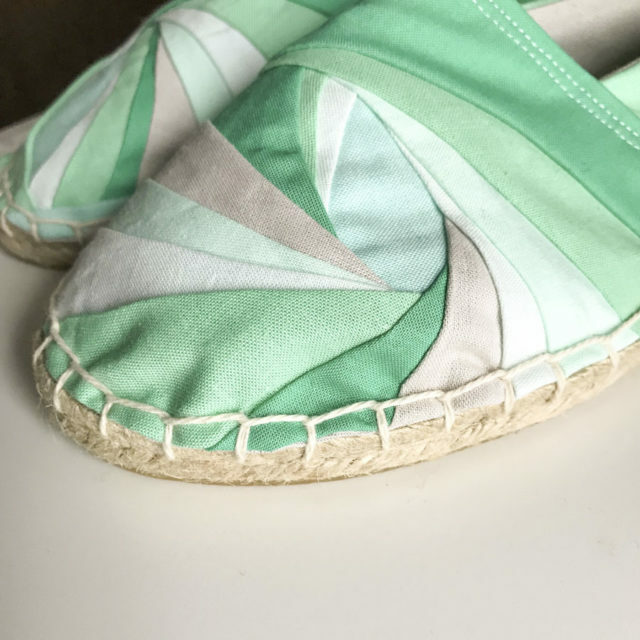 Her philosophy is that quilting can help us explore our true selves and she has brought that same message to us with these quilted espadrilles. Instead of providing a tutorial on how to do exactly what she has done Melanie wanted to encourage people to explore their own quilting techniques. Melanie travels across the country giving presentations on what she calls planned and unplanned quilting. It’s a combination of making improvisation based, unplanned, quilting decisions but within enough structure that quilters are able to build something beautiful and concrete. What Melanie really encourages is taking small leaps of faith in trusting yourself to follow your gut in a way that guarantees self-exploration and success. Are you getting excited and slightly tingly? Yeah, me too. That is the feeling she evokes. It’s so easy to see how this approach makes it possible to dig into the passion that we all feel while creating and move onto creating something so incredibly unique and personal. 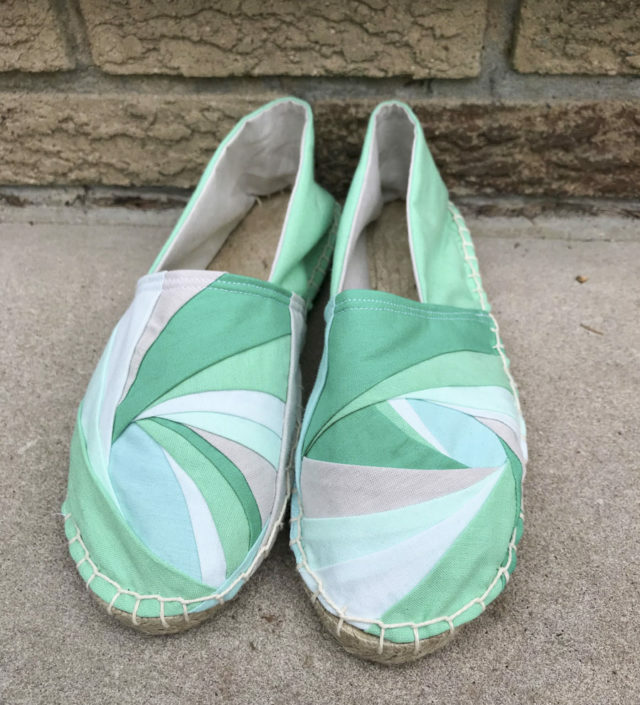 As a result, Melanie opted out of creating a how-to for these shoes and instead is encouraging quilters to create using what speaks to them in their quilting practice. 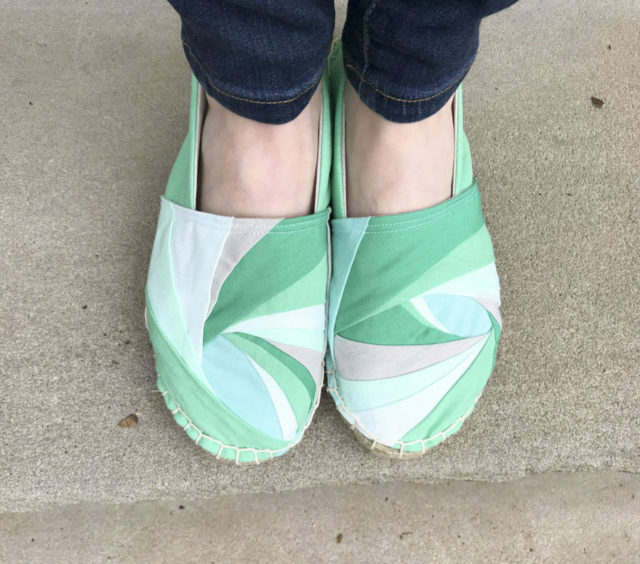 Check out her blog post for information on her Thumbprint Improv and links to curve piecing as well as her thoughts on the process of making shoes! 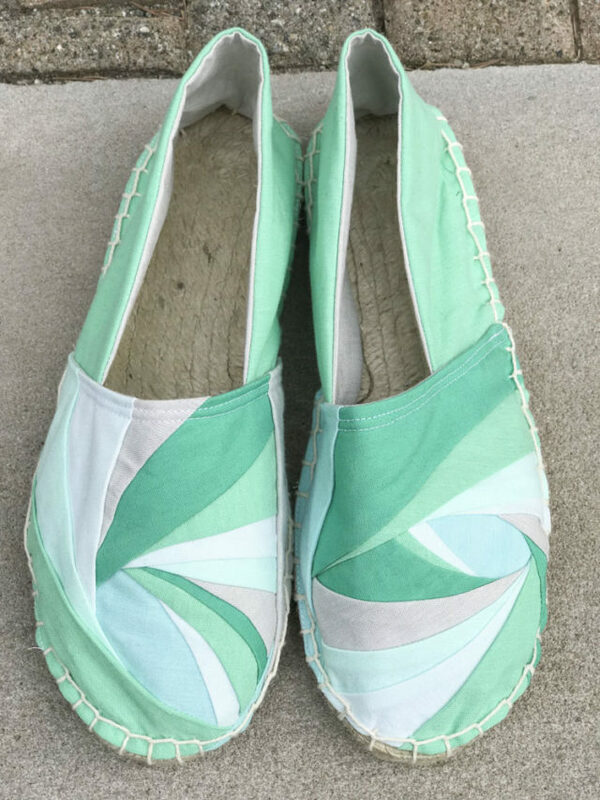 If you are feeling inspired, and who wouldn’t, grab an I GOT IT kit from the shop and your scraps and get quilting your own shoes! Melanie Tuazon is a quilter, teacher and writer who found her creativity after years of covering creatives as a journalist. 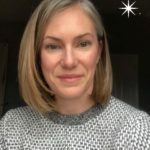 She discovered quilting as a new mother and uses the practice to serve the parts of her life that need order, artistic exploration, or something in between. 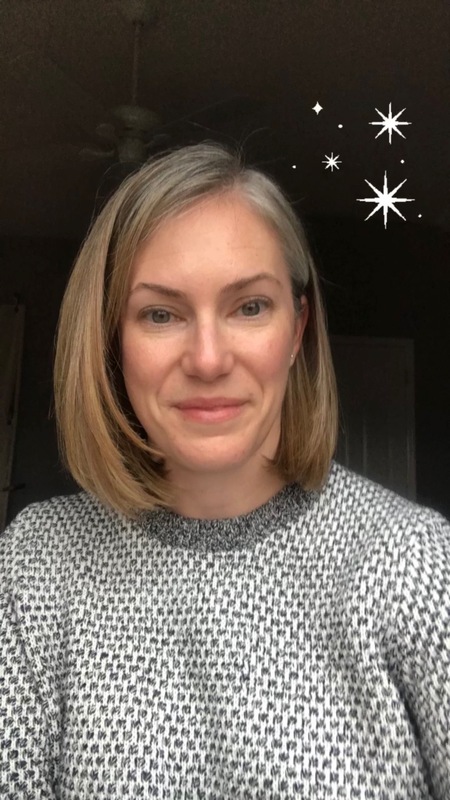 When not holding a needle or a pen at home in New Jersey, she travels to teach workshops and speak about the power of a personal practice. Her quilts can be seen in exhibitions and shows around the world.